Everybody, at some point, has attempted a diet, and you’ve probably asked yourself why it isn’t working. Whether you’re trying to knock off a quick 10 pounds before a vacation, fit into a new outfit, or improve your overall health, diets are the number one option. However, diets don’t work. And, what everybody wants is sustainable weight loss. There are studies indicating that nearly everyone who goes on a diet regains their lost weight, and often puts on more than they lost. So, dropping a few pounds for a vacation may leave you with short-term satisfaction, but you’ll pay for it in the long run. Dieting, in general, is not a good way to achieve sustainable weight loss. And, fad diets or crash diets are even worse. These types of diets usually center around food elimination. Celebrities often endorse severe caloric restriction, which is nearly impossible to follow, and quite frankly, hurts your health. Your body can simply not run efficiently on three juices per day. And, just like the weight loss on these diets might be extreme, so is weight gain. Research shows that people who adopt fad diets, or “crash diets,” put on more weight than they lose a short time after concluding these diets. So what gives? If dieting doesn’t work, does it simply mean you’re doomed as you age and put on weight? Should you forget about trying to achieve the health benefits associated with weight loss? Of course not! There are ways to shed pounds and improve your health and physique in a sustainable way that can lead to benefits for years to come. One of the keys to sustainable weight loss is taking a little more care when it comes to selecting calories. For example, let’s take a look at a 500-calorie breakfast consisting of a regular sized blueberry muffin (about 380 calories) and an eight-ounce glass of orange juice (112 calories). In that breakfast, you’re only getting two items, and you’ll surely be hungry a couple of hours later, if not earlier. Also, those items are pretty light on nutrition. The calories are made up of about 16 grams of fat, 80 grams of carbohydrates, 6 grams of protein, and 55 grams of sugar. Furthermore, you’re only getting 1.5 grams of fiber. All that sugar has the potential to be stored as fat, which can lead to weight gain, type-2 diabetes, and heart disease. Now, let’s take a look at a 500-calorie breakfast that can lead to better satiety. This breakfast will help prevent you from snacking later in the day by regulating hunger hormones, like leptin and ghrelin, while packing a nutritional punch that revs up your metabolism. This breakfast comes in at 475 calories and contains substantially more food that the sugar-filled muffin and juice breakfast. In fact, you may even need to split it into two meals! Not only will the protein in this breakfast keep you full and regulate appetite for the rest of the day, but it will do a good job working to maintain muscle mass. Another benefit is that it features over 6 grams of fiber. The way your body uses the calories in each breakfast is also different. The whole grains in the oats and the naturally-occurring sugars in the blueberries and peanut butter will all be slowly absorbed and used as energy throughout the morning. This is due to the presence of fiber, which allows your body to process them slowly and avoid the likelihood of blood sugar and insulin spikes. As you can see, the choice of calories makes a big difference. A term that’s been gaining traction as of late is “flexible dieting,” and it can be rather confusing for some. Some people take it to mean that they can eat whatever they want as long as it fits into their daily caloric allotment. And this is all well and good, except that if you decide to include a Big Mac and fries or a few slices of pizza every day, you’re not going to have a lot of room for other foods and nutrients. Eating “flexible” should still have a balanced split of nutrients and nutritious foods, which is why I prefer complimentary eating. Complimentary eating involves basing meals and overall food intake around nutrient-dense items that work together to create a supportive environment for weight loss. It’s not a food elimination type of eating system, but rather one that emphasizes lean proteins, like eggs, chicken, low-fat dairy, fish, and bison. It also includes fibrous carbs (like fruits and vegetables), starchy carbs (like sweet potato, oatmeal, brown rice), and healthy fats (like avocado, olive oil, nuts and nut butters). Complimentary eating allows for a variety of foods and lets you enjoy many flavors. When you stick to complimentary eating 85% of the time and eating whatever you want 15% of the time, you’re eating in a sustainable way that will encourage fat loss. To lose weight, you need to be taking in fewer calories than you’re expending every day. Now, this does not necessarily mean eating less as the breakfast example showed. If you’re regularly eating a Standard American Diet (SAD) high in refined carbohydrates, processed foods, and added sugars, switching to a complimentary diet will almost automatically lead to a reduction in calories. You’ll be less hungry, and the foods you take in will be less dense calorically. For those who already eat relatively healthy, you can either cut calories by 200 to 250 each day or increase your activity levels. Now, let me show you why I think adding activity—and specifically resistance training—is the best way to aid and maintain fat loss in a sustainable way. Exercise and resistance exercise are probably the best ways to enhance and maintain fat loss. One of the biggest reasons is that when you perform resistance exercise, you’re building and maintaining muscle mass. And, the more muscle you have, the faster your metabolism works, and the more calories you burn. In fact, even gaining one pound of lean muscle can rev up your metabolism, so you’re burning an extra 30 to 50 calories per day. Resistance training works much better at retaining and building muscle than cardiovascular work like distance running or cycling. Although these activities are great for your heart and can put you in a caloric deficit, they are best used as complimentary activities in a fat loss program. Do them for maybe 30 minutes per day, two or three days per week at first, then focus on resistance training for two or three sessions per week. Adopting an exercise routine with a complimentary eating style is the ticket to sustainable weight loss. Sometimes people are active, eating right, and still not finding any difference in their weight, and that’s okay. You can either add a little more activity, boost the intensity of your workouts, or scale back on calories a little bit. Of course, there could be something else at play, too. Sometimes the scale can be deceiving, especially if you’re resistance training and eating a complimentary diet. Let’s say, for example, you’ve built four pounds of muscle and shed four pounds of fat in the past month. Your net weight loss is zero, but your body composition has improved. You’ve built healthy muscle, turned up your metabolism, and given your body some more shape and tone, yet your weight is the same. You’ve re-comped your body. Therefore, a more indicative measurement to pay attention to is your body fat percentage instead of the number you see on the scale. You can check body fat with electromagnetic scales (your gym will have one, or you can purchase one for about $100). Or, you can have a knowledgeable person measure it with calipers. Diets, quite simply, don’t work. The only way to encourage sustainable, long-term weight loss is by making lifestyle decisions that compliment weight loss goals. Eating nutritionally dense foods, increasing protein intake, staying in a sustainable caloric deficit, and including resistance training is the proven recipe boost your metabolism, shed fat, and keep it off. “Dieting Does Not Work, Researchers Report,” Science Daily, April 5, 2007; https://www.sciencedaily.com/releases/2007/04/070404162428.htm, last accessed June 6, 2017. 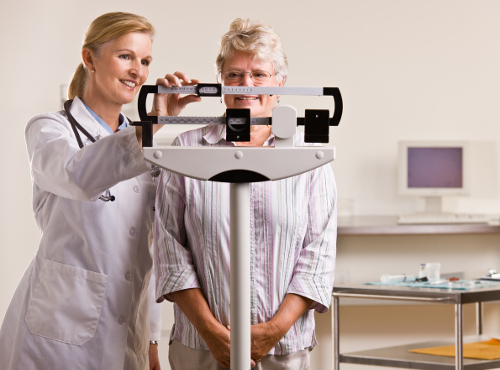 Purcell, C., et al., “The effect of rate of weight loss on long-term weight management: a randomised controlled trial,” The Lancet, December 2014; http://dx.doi.org/10.1016/S2213-8587(14)70200-1. Aamodt, S., “Why You Can’t Lose Weight on a Diet,” New York Times, May 6, 2016; https://www.nytimes.com/2016/05/08/opinion/sunday/why-you-cant-lose-weight-on-a-diet.html?_r=0, last accessed June 6, 2017. Tipton, K. D., et al., “Improving muscle mass: response of muscle metabolism to exercise, nutrition and anabolic agents,” Essays in Biochemistry, February 1, 2008; 44:85-98; doi: 10.1042/BSE0440085. Tipton, K. D., et al., “Exercise, protein metabolism, and muscle growth” International Journal of Sport Nutrition and Exercise Metabolism, March 2001; 11(1):109-32; https://www.ncbi.nlm.nih.gov/pubmed/11255140, last accessed June 6, 2017. McPherron, A., et al., “Increasing muscle mass to improve metabolism,” Adipocyte, April 1, 2013; 2(2):92–98; doi: 10.4161/adip.22500.